CAPTAIN Knowledge Musona watched from the touchline yesterday as his teammates conducted their Day 2 training session ahead of the Congo-Brazzaville encounter at the National Sports Stadium this Sunday. 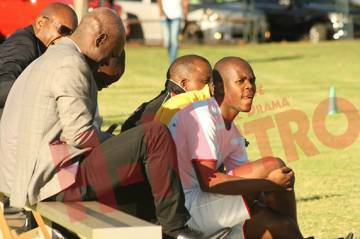 Coach Sunday Chidzambwa and his technical team are sweating on Musona’s fitness after he suffered a groin injury at his Belgian club a fortnight ago. Warriors team doctor Soman Mudariki is, however, confident that the talisman will make it for Sunday’s crucial encounter. Mudariki said after contacts with doctors at Musona’s team, Sporting Lokeren, and their own assessments here, indications are that he will be able to lead the team. “We are still assessing him, we have been in touch with his doctors from Lokeren (Sporting) and continuing his routine. “We rested him from today’s (yesterday) session but we are hopeful he will be fit to play a part on Sunday,” he said. However, the Warriors talisman spoke glowingly ahead the do-or-die tie saying the players are ready to seal their qualification. “The hopes of qualifying for AFCON is something that has to go to our minds, what we do on the field is what counts,” he said. After a 1-1 draw against the Red Devils away, Musona said they will fight for each other and push for the desired result. “We encourage each other to give a 100%, give everything whatever happens we see at the end of the game, each and every game we always want to give our best. “It’s the same thing that we did in the previous games, we worked hard for each other, we covered for each other and we got results so we have to continue and do it again on Sunday. “With the guys that are here it’s possible, we cannot get tired now on the finishing line,” he added.